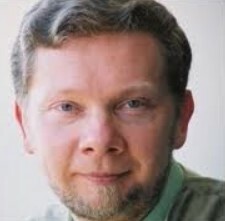 Eckhart Tolle is probably best known as the author of the best selling The Power of Now: A Guide to Spiritual Enlightenment . The core theme of this site is how to think and how to not think. The foundational practise upon which this theme is based, is the practise of mindfulness also known as present moment awareness. As far I am concerned, it was Eckhart Tolle's early work with "The Power of Now" and subsequent videos of Eckhart's talks that opened my eyes and awareness to the dimension of mindfulness. I had read Thich Nhat Hanh's book The Miracle Of Mindfulness: The Classic Guide to Meditation some years prior to discovering Eckhart Tolle and it made a distinct impression on me, but this whole business of mindfulness remained just an interesting idea. At that point in my life I was on a quest to discover and appropriate as much information as I could about "life the universe and everything" and mindfulness was another interesting "tick in a box". My quest was largely about gathering, assimilating and processing vast amounts of information that integrated into my ever expanding "inner map of reality". So quite naturally, after my first reading of "The Power of Now" I thought "OK done that, got it, what's next?" But after a while I sensed that maybe I hadn't got it. So I read it again but this time very slowly, at a pace of maybe several pages a day. As I reflected and contemplated the teaching I could sense an awareness arising with me that resonated very deeply with Eckhart's insights and teaching. This second much slowing reading more or less coincided with the growing realisation that there was much more going on in this whole business of "life the universe and everything", than my thinking mind can comprehend. I found that that rather than just processing the words as information I was increasingly absorbing the energy behind the words. Metaphorically speaking, it was as though a greater intelligence or awareness, something more than "me", was recognising and connecting with something it already knew. After a few more slow reflective readings of "The Power of Now" and several of Eckhart Tolles's other books it became clear to me that whilst his transformation into deep awareness and a full awakening was an overnight experience that was't going to happen to me. I realised that I was a "work in progress" and that I needed to apply Eckhart's insights and slowly and systematically put his insights and teaching into practise in my everyday life. In order to be able to do this I then realised that I needed to develop some personal tools that I could use each day to discipline and train myself so that the practise of mindfulness would become a more or less automatic aspect of my behaviour and thought processes. So I extracted six core practises suggested and wrote them on a sheet of paper and worked on two at a time. 6 practices based on "The Power of Now". In my own personal experience, of all the many, many books I have read on the subject of personal development and spiritual growth I have found that Eckhart Tolle articulates very clearly what is involved in the process of personal transformation. I commend the following books to you and I suggest that you read them in the order in which they are listed.